The reunited METAL CHURCH — Ronny Munroe on vocals, Kurdt Vanderhoof and Rick Van Zandt on guitars, Steve Unger on bass, and Jeff Plate on drums — will release tenth studio album, "Generation Nothing", on October 22 via Kurdt's label Body Of Work Recordings in conjunction with Rat Pak Records. The "Generation Nothing" title track can now be streamed using the SoundCloud widget below. 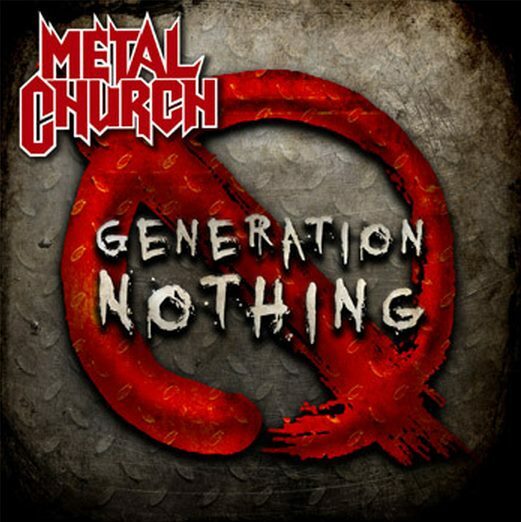 Munroe said in a recent interview with Metal Assault that the new METAL CHURCH effort would contain material that is "very reminiscent of the old days with some stuff that's very 'now.'" He added: "There's a bit of… I'm not going to say 'prog' because it's not, but there's a couple of elements in there that are a little bit progressive. For the most part, out of this batch of songs, they really sound more reminiscent of the early days than anything we've done before with this lineup. This excites me very much, and I think the fans are really going to dig it." Regarding the circumstances that led to METAL CHURCH's breakup in 2009, Ronny said: "Well, in a nutshell, without going into a huge and long story here, it was certain aspects of things that had continued to happen to the band throughout its career. Not having the proper management and the proper people in place that were handling us. You know, we ended up taking some shows we shouldn't have taken and that just led to where Kurdt was really getting fed up and then we all kind of got that way. Basically, we figured before we end up disbanding because of other reasons such as maybe starting to fight with one another or whatnot, we decided to go ahead and end it then. We all ended up friends and we wanted to keep it that way. So I won't go into specifics, but we all know what the music industry is like now compared to what it was like back then. We just didn't have the right people in our camp." Asked what the band is going to do differently this time around to avoid falling into the same trap, Ronny said: "This time around we're going to release this next record on Kurdt's label. Basically, Kurdt and the band and whatnot are taking a lot more control of the situation. Yes, maybe the downloading thing is even worse than 2009, but also on the other hand, if you know what you're doing and you use the Internet correctly, you can actually have success. Kurdt's been doing that with his prog band PRESTO BALLET and whatnot. In this day and age, the time is right to go and try something on your own. If it doesn't work, you can always end up going out and searching for a label or something. We're going to take a shot at it and see what happens and I think we're probably going to have some decent success."